IT’S BIGGER THAN YOU THINK! 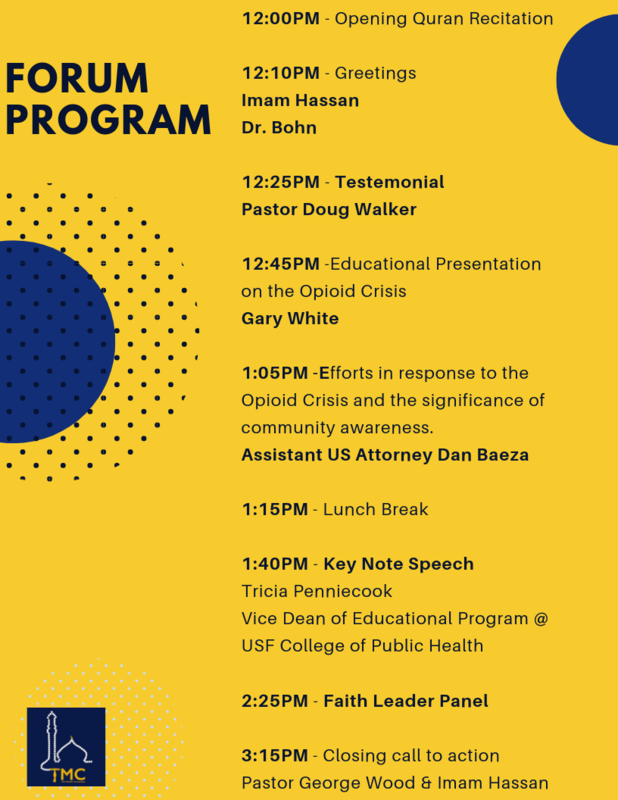 Opioid epidemic is a growing problem of prescription drug abuse in the US and it is reaching the Muslim community faster than we thought. This forum will help bring awareness, provide a support network, tackle it's social and spiritual ramifications and the path to recovery. Seminary Open House: During the event, there will be a short open house to introduce the community to Darussalam Seminary in Chicago. The institution offers a 6 week Summer program that is ideal for students who want to spend time learning sacred knowledge. Babysitting will be offered for children ages 4-9. *Please note that on the day of the event, there will be a cap on how many children can be registered for babysitting. If you plan on attending, please register beforehand. If this would cause any financial difficulty, please email TampaSacredKnowledge@gmail.com with the subject “scholarship” after filling out the babysitting registration form and include the names of the children that will attend. There is no need to provide any explanation. There is no cost to register for the event. There will be an option to purchase a text that goes along with the course at a price of ($15.40). The text that goes along with the course will be emailed to registrants the day of the event. Complimentary dinner will be provided. If you would like to contribute towards costs, including for future events, please use this link below. Your involvement is greatly appreciated. * Please note that unless due to certain special circumstances, there are no refunds for any of the costs/payments associated with this event.